Risa Jones, half-aedh / half-werewolf can enter the realm between life and death. She can speak to the dying and the dead, and she can see the Reapers, collectors of souls. What she cannot yet see is the identity of a stranger murdering women and draining their blood. Now Risa must summon her gifts to find him, even if it means putting her own life in danger. But Risa needn't look far. The killer knows who she is. Fascinated by Risa, he engages her in a sinister game: the chance to save the life of his next victim by deciphering his series of clues. In a race against time, she enlists the help of the Reaper, Azriel. But as an attraction between them grows, so does the fear that the stranger's motives are only part of a larger, more dangerous scheme - one that has lured Risa and Azriel into the dark. 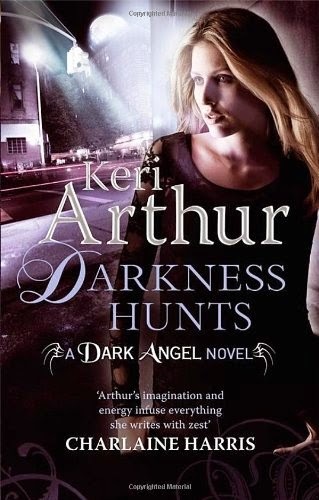 I've become really hooked on this series over the last few weeks so it'll be no surprise if I tell you that I absolutely devoured Darkness Hunts. Poor Risa seems to go from one fight for her life straight into the next one without a moment to even breathe let alone sleep or eat. Now she has managed to capture the attention of a murderer, one who is attacking his victims on the astral plane, somewhere that even Azriel can't help her so this time she really is on her own. I absolutely love seeing how far Risa has come in this series, she has gone from strength to strength and although she makes mistakes she always comes back fighting. I think one of the things I love most about her is that she isn't invulnerable, she has impressive abilities but she still gets injured and she feels the after effects of a battle just like anyone else would. I can't even tell you how much I've been enjoying the relationship development between her and Azriel. I've been crazy about his character since the very beginning and desperately want to see the two of them work things out but it isn't easy for them when they are both so different. There are obviously deep feelings there though and I have high hopes that they'll work things out. Another thing I'm really enjoying is seeing her connection with her sword Amaya, I have a feeling that this is only going to grow stronger with time and it will probably be the thing that saves Risa in the long run. I'm also glad we finally have some kind of resolution to things with Lucian. I've had a bad feeling about his character from the beginning and some of his actions in this book are despicable. I have to say the one thing that stopped this from being a five star read was Risa's reaction when she finds out what Lucian has been up to. I expected her to be outraged by the things he did and she seemed to take them far to calmly and in her stride. I would have been much happier if she had given him a piece of her mind and kicked him into touch. Like all of the previous books Darkness Hunts has plenty of action, Risa is dealing with the aftermath of her attack by her father's enemies and at the same time trying to juggle the wishes of the vampire council and the Directorate who both need her help, she is having to keep secrets from the people she loves in the hope of protecting them from a madman all while she struggles to deal with her feelings for Azriel and the way he keeps blowing hot and cold with her. I just can't wait to see what happens in Darkness Unmasked!